Care-Fusion is a cutting edge combination of the four best creatine varieties on the market. By combining these varieties you get the benefits of all of them in one product. This is one of the best tasting supplements you will ever taste. HIT Supplements takes pride in putting out premium supplements that taste great. You will enjoy drinking this one. CareFusion is quite possibly the best creatine product available anywhere. Creatine is one of the most popular supplements today and that’s not going to change anytime soon. There is a great amount of research to support its performance enhancing effects for a wide range of sports; from sports that demand intensive strength and endurance training like bodybuilding, weight lifting, cross fit, cycling, and MMA to sports that require speed, such as sprinting, soccer, rowing, and swimming. Creatine supplementation can greatly improve performance in the areas endurance, interval training and maximum strength. Not all creatine is created equally and creatine powders can vary widely in quality and purity. 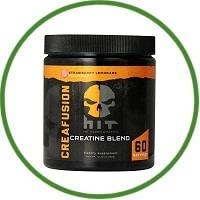 That’s why, HIT created CareFusion with a superior blend of top tier and highly researched creatine powders. CareFusion isn’t viewed as the best creatine product on the market for nothing. Our blend of creatine increases the amount of energy of your muscles by increasing the amount of ATP available. As initial fuel for muscle contractions, ATP provides energy by releasing phosphate and becoming adp. Through the use of creatine phosphate, ADP then becomes ATP again in order to be utilized within the muscle as energy. Having extra creatine allows your body to regenerate ATP more quickly which allows you to work your muscles to their maximum potential because it helps your body to consistently feed them the energy they need during intensive training.